In 2015, Ninja ventured into the drip coffee market, launching the Ninja Coffee Bar and offering consumers the ability to brew coffeehouse quality coffee in their very own kitchen. As VP of Creative at SharkNinja, positioning the Ninja Coffee Bar to succeed in-store and online was the task. Collaborating with internal and external partners, we collectively executed a winning strategy across all consumer touch-points. Within a year of launching, the drip coffee market increased overall, with Ninja grabbing the #1 position. By year two, the Ninja Coffee Bar franchise gained over 25% share of the entire coffee market, grossing over $120M in 2016. Once you try the Ninja Coffee Bar, you'll never experience your favorite coffee the same way again. With smooth, rich, balanced flavor, four different brew varieties and multiple serving-size options - you've got an all-in-one coffee brewing system, all in the comfort of your own home. Now, the best coffeehouse in town is on your countertop. Other home coffeemakers, consider the coffee bar raised. 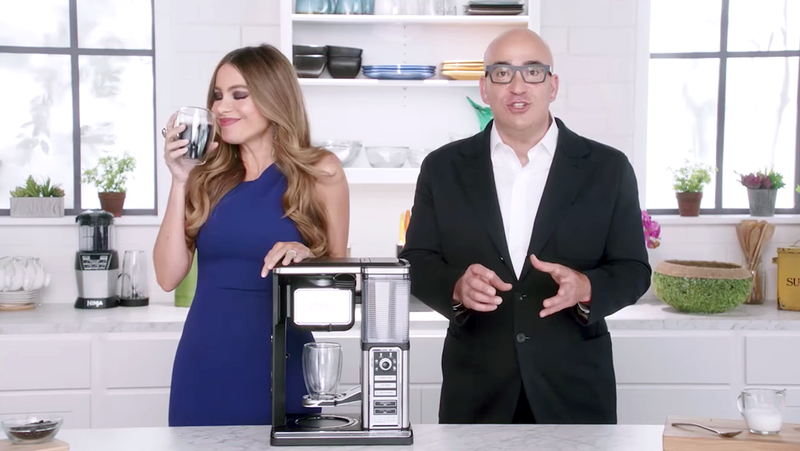 Coffee has been in Sofia Vergara's blood since she was a little girl. The rich, flavorful Colombian coffee she grew up drinking has been something Sofia has been missing for years. And though she's most known for being one of Hollywood's top comedic actresses, she's also a shrewd business woman who is pretty serious about her coffee. Which is why Ninja partnered with her to launch the Ninja Coffee Bar®. One of SharkNinja's keys to successfully launching best-in-class products has been leveraging both long and short form media. For the Ninja Coffee Bar infomercial, SharkNinja CEO, Mark Rosenzweig, brought the passion for the product; Sofia brought the passion for coffee. In the more traditional 30 second commercial produced by Ogilvy, Sofia says "goodbye" to her barista and "hello" to her Ninja Coffee Bar. Designing product descriptive packaging, creating a robust out-of-box experience, executing multi-funnel, multi-platform and multi-media digital campaigns, supporting national PR events and building a cohesive, integrated web experience are just a few of the ways our internal creative team brought the Ninja Coffee Bar to market in-store and online.